(ABILENE) – The first day of classes had that shiny new feeling Monday at Texas State Technical College. 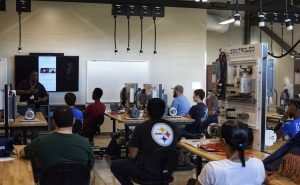 TSTC opened the Industrial Technology Center on Quantum Loop next to Abilene Regional Airport just in time for fall classes. The building is home to the new Electrical Power and Controls, Industrial Maintenance and Welding Technology programs and is the new location for the Emergency Medical Services program. The morning’s first group of Welding Technology students toured the automated and metallurgy labs. This semester the program will have morning, afternoon and evening sessions. Greg Nicholas, lead Welding Technology instructor for TSTC’s West Texas campuses, spent time this summer organizing the welding labs. He said he did not sleep much Sunday night. McKenzie Smallwood, 18, of Odessa heard about TSTC on Pandora and later saw a billboard she considered a “sign” to enroll. Smallwood was exposed to welding through her father. She is pursuing the Associate of Applied Science degree in Welding Technology. She said she cannot wait to start welding later this week. “It’s exciting to go to a technical college and learn how you do things,” Smallwood said. Jacob Rose, 17, of Mertzon was encouraged to attend TSTC by a family friend. He comes to TSTC with welding experience from Irion County High School, where he graduated earlier this year. Rose was in a whirlwind of excitement as he moved to Abilene the weekend before classes began on Monday. “It’s a great opportunity to meet new people,” he said. Kelsie Terry, an Emergency Medical Services instructor, was excited about being in the program’s new location. She said faculty members can now lead students in a mock emergency room and use video for student scenarios. The program was previously housed at TSTC’s East Highway 80 location in Abilene. “There’s more tools and resources to make it as lifelike as you can in a setting,” she said. Jonathan Brooks, 19, of Avoca said he was inspired to study Emergency Medical Services because of watching people care for his relatives in hospitals. One of the first lessons he learned Monday was how to render a blood pressure reading. He saw the new building for the first time Monday. “They put a lot of work into this,” Brooks said. Construction on the 56,000-square-foot Industrial Technology Center began in June 2017. The building is the first on what is planned to be a 51-acre campus. TSTC’s newest building among its 10 campuses was designed by Parkhill, Smith & Cooper, which has offices in Abilene and throughout Texas. Imperial Construction Inc. of Weatherford used local subcontractors where possible to construct the building. This entry was posted in Abilene on August 27, 2018 by Daniel Perry.